Welcome to this chapter in the LEGENDARY SURFERS series, part of Volume 4: The 1940s. Even after World War II ended, wars and threats of war pervaded the post-war period. Civil wars raged in many areas, the Soviet Union was militarily forcing Eastern European countries to go communist, much of Asia was moving towards communism, and what came to be called “The Cold War” descended upon most of the world split between democratic and communist countries. The Cold War would go on for four decades. Revolutionizing surfboard design back on the Mainland in the period after the war, Bob Simmons was the man and his boards were thee machines. Quigg and Kivlin were associated with him and so it was natural that they were riding his designs. Both Quigg and Kivlin were shapers, themselves, and Quigg went on to become one of the great surfboard shapers of the 20th Century. He and Kivlin and the others would be largely responsible for the emergence of the “Malibu board,” which popularized the sport throughout the 1950s. But, at war’s end and the beginning of the closing of what Sir Winston Churchill, in 1946, labelled the “Iron Curtain,”6 Quigg and Kivlin were still the apprentices, while Simmons was the master. A major factor in surfing’s post-war growth was this migration to Hawaii of hard-core surfers from California. The previous two waves of mainland surfer migrations, prior to the war, had been mild compared to this third. And the third was small compared to subsequent waves that occurred following the distribution of the first big wave photograph over international press services in 1953. Walter Hoffman and his friends comprised the next wave of Coast haoles to come to O‘ahu, after Zahn, Quigg, Kivlin, Porter Vaughn and Rochlen. 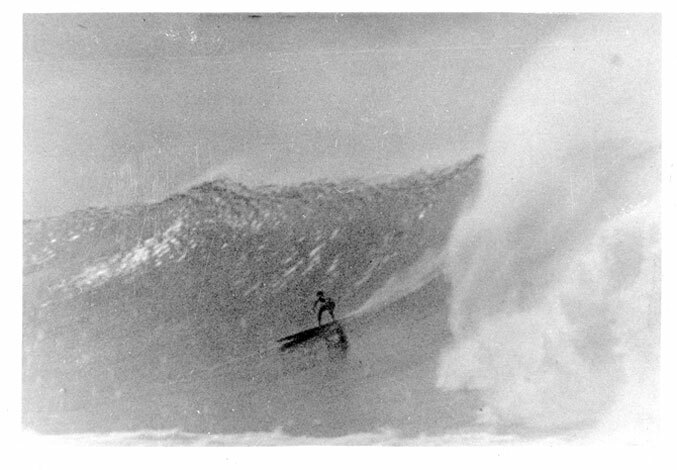 Hoffman and crew became, in essence, the Fourth Wave of Coast haoles to go Hawaiian in 1948. Hoffman and Ted Crane arrived in Waikiki in the Summer of 1948, having come across on the S.S. Lureline. World War II had interrupted the lives of most everyone in the “civilized” world and, in the case of surfing, put a lot of things on hold. 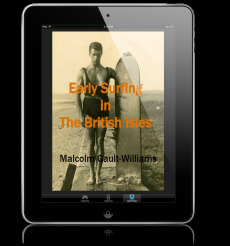 Following the war, however, there was a resurgent interest in and some changes to how surfing was organized in its traditional early 20th Century capitol, Waikiki. At one point, Abel lifted up his house in Waikiki and made it a two-story when he needed more room for the family. Later, when he moved his family to Kaimuki, George Downing moved in and rented Abel’s house. Abel decided he was going to move to California which offered better job opportunities for him. Wally mentioned that Abel gave him a bunch of woodworking and other tools that he did not want to take with him to the Mainland. Among these tools was an old drawknife that was collapsible and a hand drill and a set of augers. “Wally gave these to me a couple of years ago with some other old woodworking tools,” added Wally’s son Teene. Abel did take his family to California where they did well, working with Dale Velzy, amongst others. His son Alan won the first and second Junior Mens competition at Makaha in 1954 and 1955. First glassing for Jacobs and Velzy in Venice, Alan went on to become a well-known shaper in his own right. 1 Grun, 1991, pp. 524-527. 2 Grun, 1991, p. 527. 3 Grun, 1991, p. 527. 4 Stecyk and Pezman, “Rabbit Kekai -- Talking Story,” 1994, p. 68. 5 Stecyk and Pezman, “Rabbit Kekai -- Talking Story,” 1994, p. 68. 6 Grun, 1991, p. 524. 7 Stecyk and Pezman, “Rabbit Kekai -- Talking Story,” 1994, p. 68. 8 Stecyk and Pezman, “Rabbit Kekai -- Talking Story,” 1994, p. 68. 9 Finney and Houston, 1966, p. 73. 10 Stecyk, “Hot Curl,” 1994, p. 72. 11 Stecyk, “Hot Curl,” 1994, p. 72. 12 Stecyk, “Hot Curl,” 1994, p. 72. 13 Stecyk, “Hot Curl,” 1994, p. 72. 14 Stecyk, “Hot Curl,” 1994, p. 72. 15 Rabbit must have Dickie confused with his brother or someone else, because Dickie died in 1943 and the third wave didn’t happen until after the war (1947). 17 Stecyk and Pezman, “Rabbit Kekai -- Talking Story,” 1994, p. 68. 18 Stecyk and Pezman, “Rabbit Kekai -- Talking Story,” 1994, p. 68. 19 Hoffman, 1993, p. 79. Intro by Steve Pezman (?). 20 Hoffman, 1993, p. 79. 21 Hoffman, 1993, p. 79. 22 Hoffman, 1993, p. 79. Quigg and others started coming over in 1947. 23 Hoffman, 1993, p. 82. 24 Hoffman, 1993, p. 86. See classic photo, on page 87, of George Downing and Big Jimmy shaking hands, with George holding the trophy and Big Jimmy looking like he was hating life. In the crowd are Walter, Ted Crane, John Lind and Termite. 25 Hoffman, 1993, p. 85. See photo of Kui Lee strumming his uke in front of the Waikiki Surf Club. 26 Hoffman, 1993, p. 79. 27 Finney, Ben R. and Houston, James D. Surfing, The Sport of Hawaiian Kings, C.E. Tuttle Company, Rutland, Vermont, ©1966, p. 72. 28 Finney and Houston, 1966, p. 72. 29 Hoffman, Walter. “Tales of Town and Country,” Walter Hoffman’s Scrapbook (The Early Years: 1948-1954), The Surfer’s Journal, Volume 2, Number 2, Summer 1993, p. 85. See photos. 30 Hoffman, 1993, p. 85. See photos. 31 Hoffman, 1993, p. 85. See photo same page. 32 Finney and Houston, 1966, pp. 72-73. 33 See Gault-Williams, “World War II,” Dorian Paskowitz’s description. 34 Hoffman, 1993, p. 89. 35 Stecyk and Pezman, “Rabbit Kekai -- Talking Story,” 1994, pp. 68-69. 36 Stecyk and Pezman, “Rabbit Kekai -- Talking Story,” 1994, p. 75. 37 Wally Froiseth to Teene Froiseth, December 24, 2010. Abel misspelt “Able,” throughout. 38 Wally Froiseth to Teene Froiseth, December 24, 2010. 39 Wally Froiseth to Teene Froiseth, December 24, 2010. Teene’s words, slightly edited. 40 Wally Froiseth to Teene Froiseth, December 24, 2010. Teene’s words, slightly edited.